This project consisted of an extensive renovation to a single-level ranch home originally built in the 1950s and altered in the 1990s. Only the garage and basement of the original home were kept. The 2nd story of the addition was softened by creating a shed dormer and a cross gable. 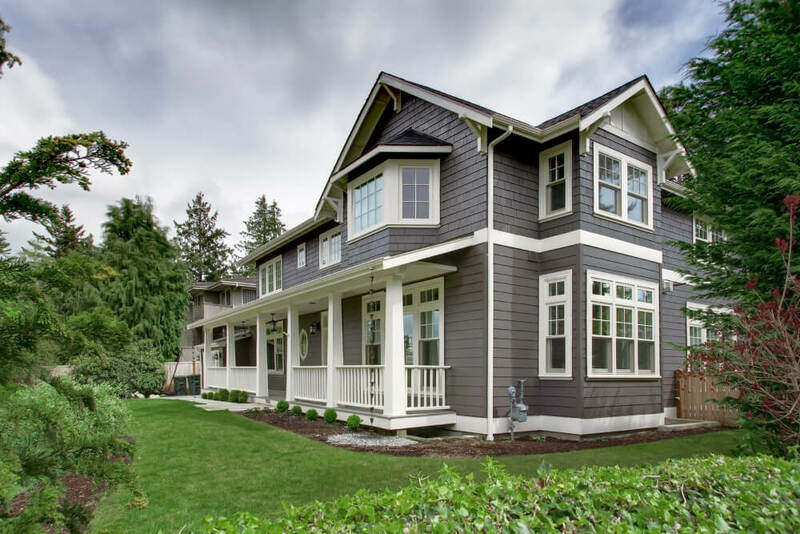 A long, west-facing covered porch welcomes visitors to the front door, and transoms above the first floor windows allow natural light to flood the home. 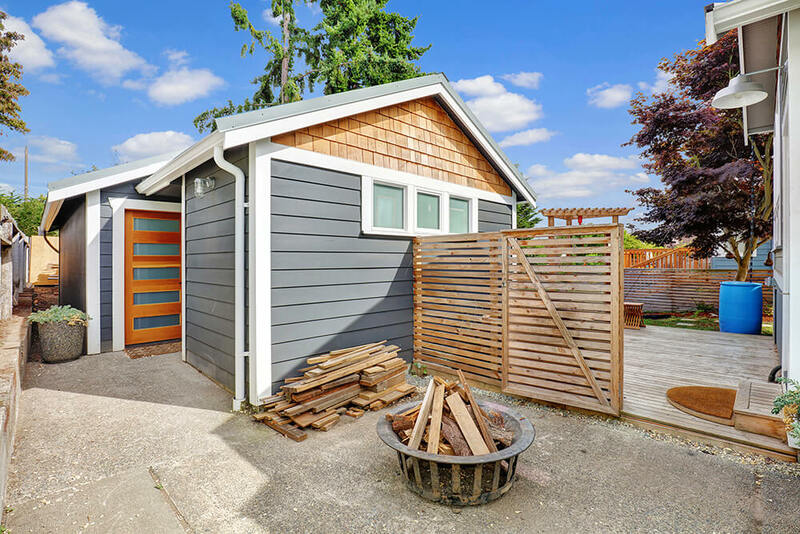 The rear door of the existing garage opens onto a back patio, and an outdoor deck built over the garage allows an expansive view of the Seattle skyline to the west. 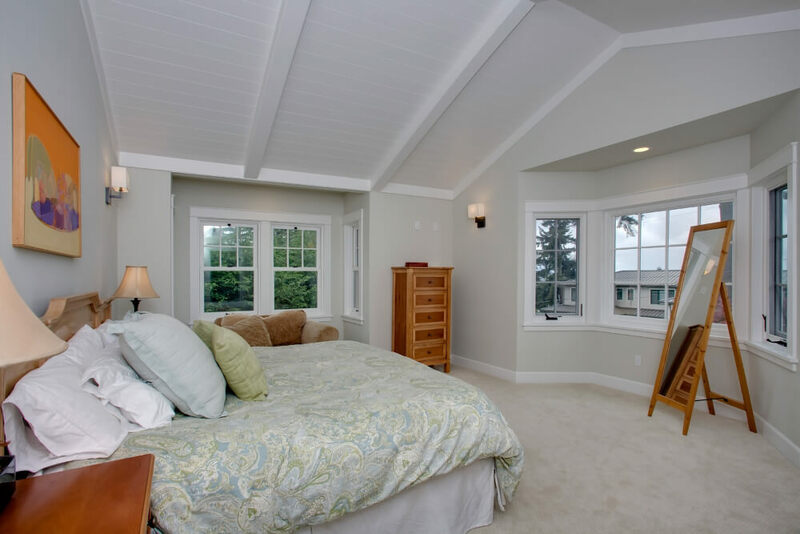 The home’s master bedroom was designed with spacious vaulted ceilings and bay windows. 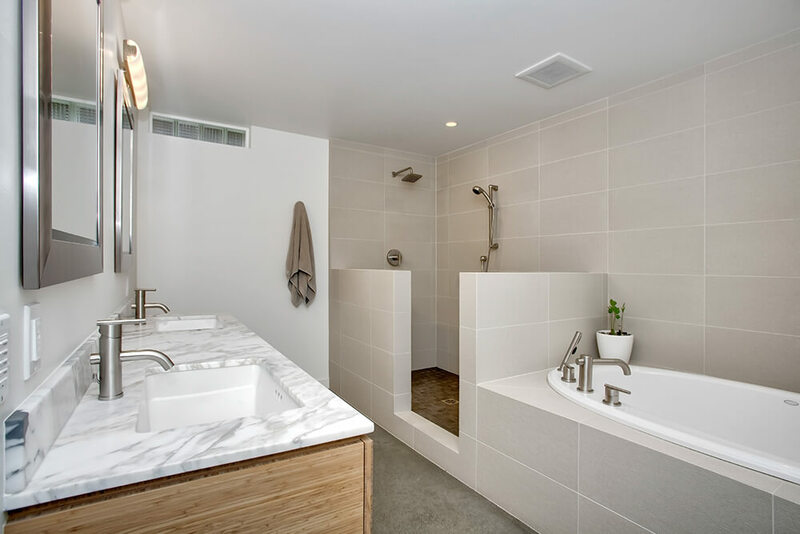 An en-suite master bath includes a steam shower and windows with views of the Seattle skyline. Exposed wooden beams stained in a rich brown add drama to the kitchen and great room, where a custom fireplace is flanked by plenty of built-in shelving. 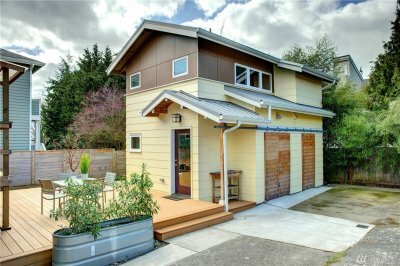 Newly arrived in Seattle in 2015 after trekking cross-country in a tiny trailer for two years, our clients didn’t need a lot of space but saw the opportunity to created a Guest Cottage (aka DADU) by adding onto their existing 1940s one car garage, as well as put a small addition on the back of their petite 1 bedroom house allowing for a real stair to the basement as well as office space and expanded kitchen. 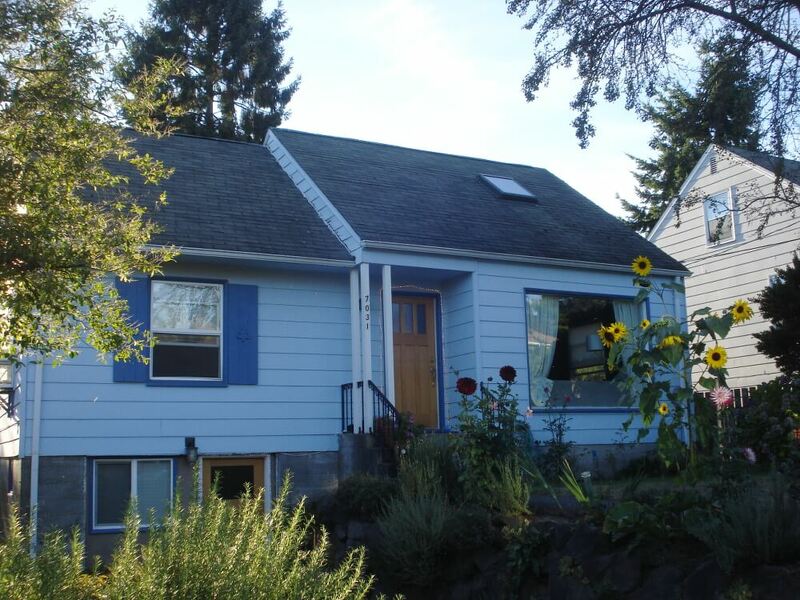 The results were a 500 sf 1 bedroom Cottage with vaulted ceilings and it’s own deck, and a sunny addition on the east side of the house. 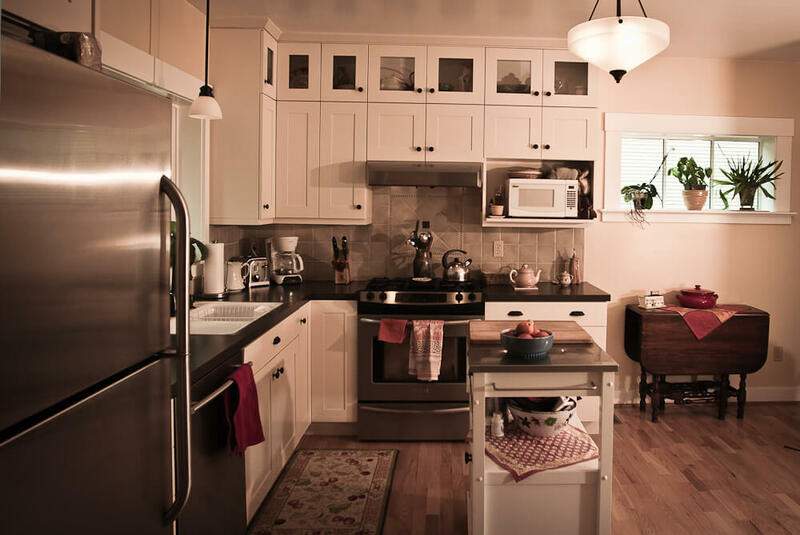 The clients were able to save a good chunk of money by doing some of the electrical and finish work themselves to stretch their budget as well as their space, with the guest cottage bringing in extra income. 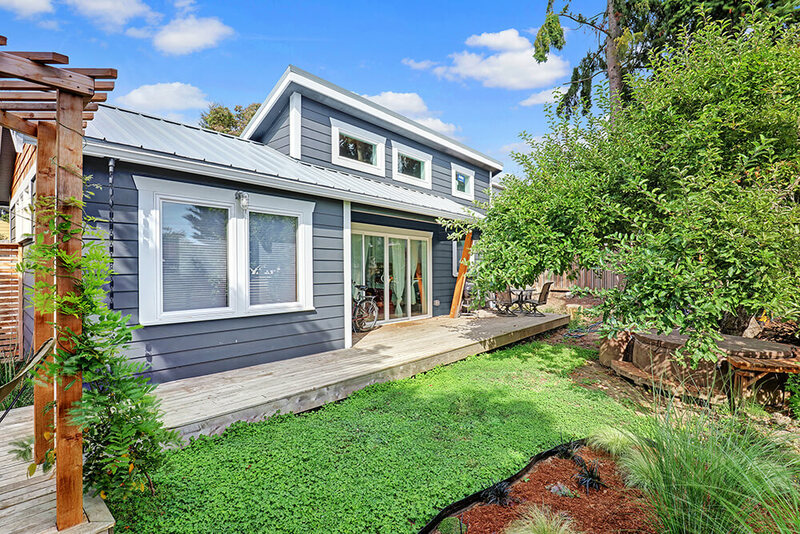 We designed this small backyard cottage (or “DADU,” detached accessory dwelling unit) for a client in Seattle’s Ballard neighborhood. 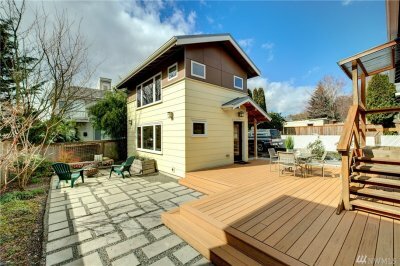 This two-story structure features a 3/4 bathroom, a compact kitchen, and a Murphy bed on the second floor. The ground floor features a spacious office area and a laundry room. The roofline was designed to allow a small amount of covered exterior space for storing yard tools and other items. The project was designed with sustainability in mind. 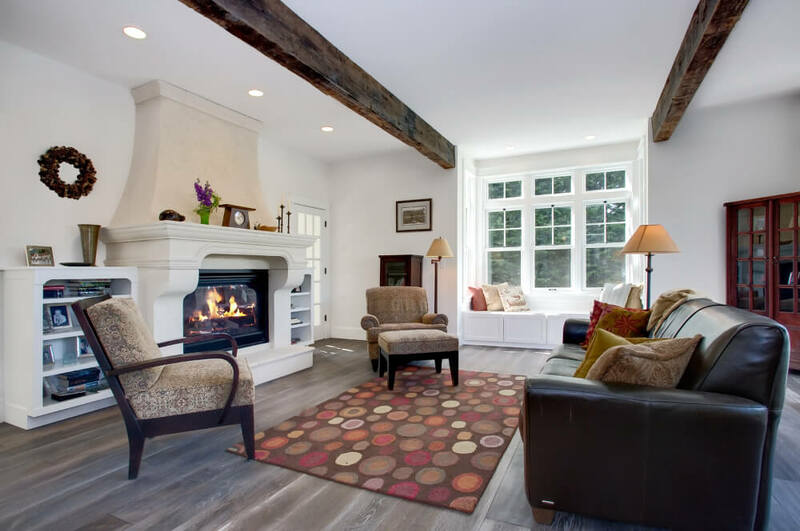 The cottage’s heavily insulated walls keep the interior comfortable year-round while minimizing heating and cooling bills. Metal roofing allows the owners to harvest rainwater for gardening and other tasks. 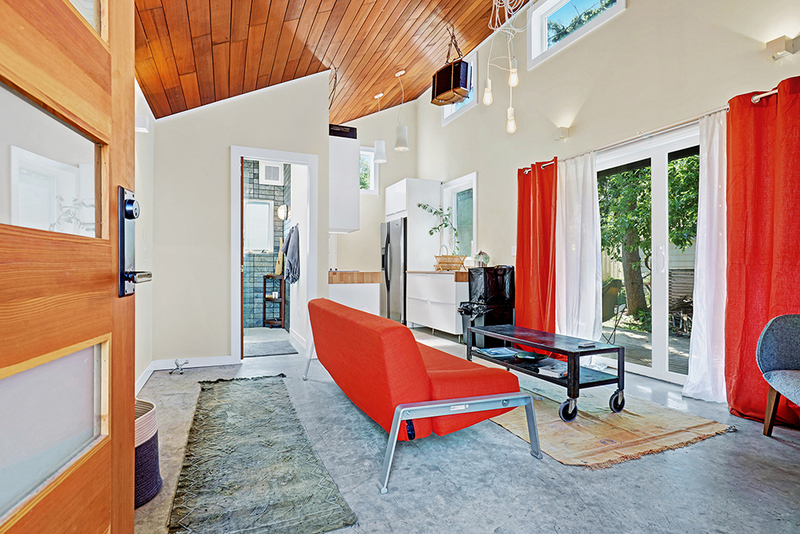 The ground floor can function as a living room or office, with exposed beams and tongue & groove decking above. 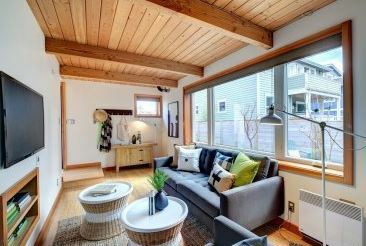 The clients wanted to completely gut the daylight basement of this brick one story home near the Beacon Hill Light Rail Station. 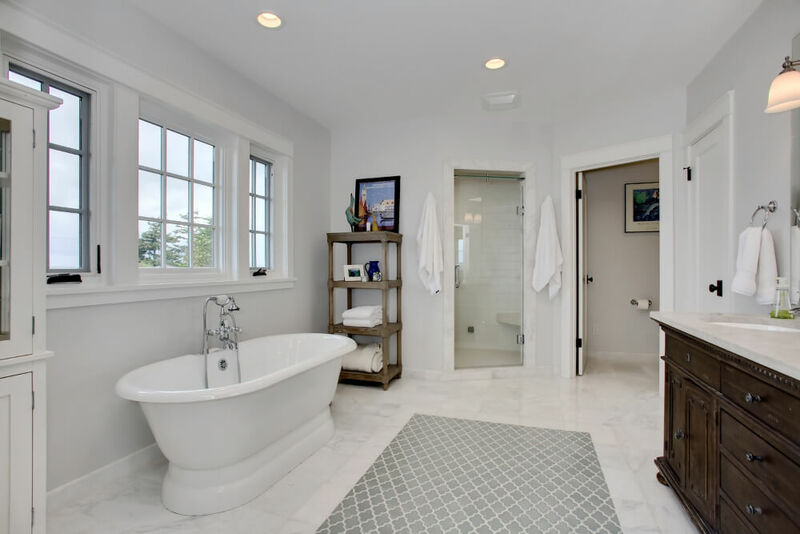 We designed a new master suite with a spacious en suite bath with walk in shower and tub in a deck. 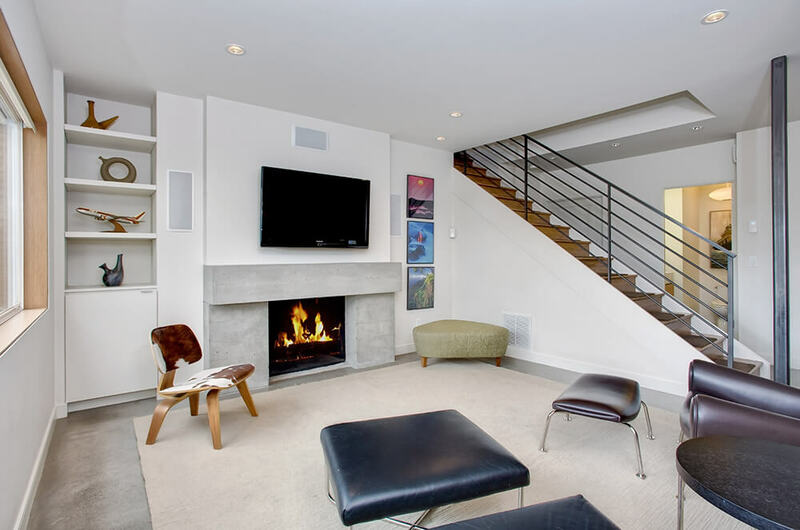 The stair was opened up with custom metal railings to a new rec room with a updated fireplace, and a wet bar and laundry behind sliding barn doors on the north end. 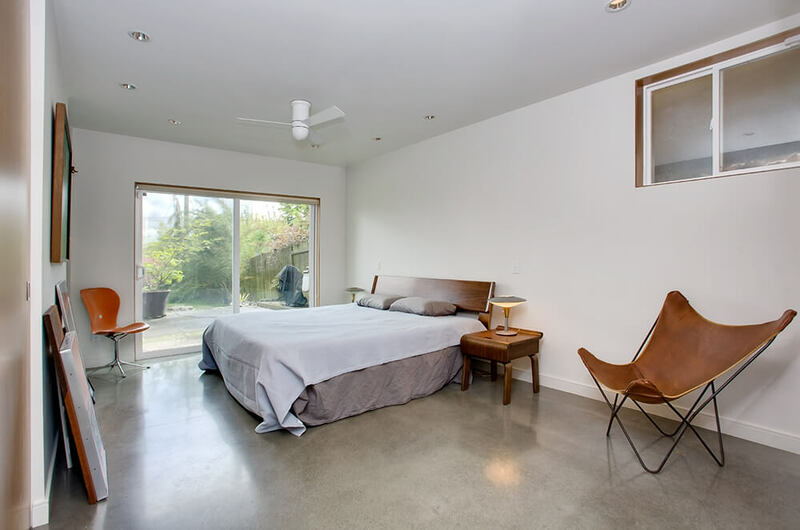 Polished concrete floors hide new hydronic radiant heating tubes for a warm on the feet experience during the damp Seattle winters. 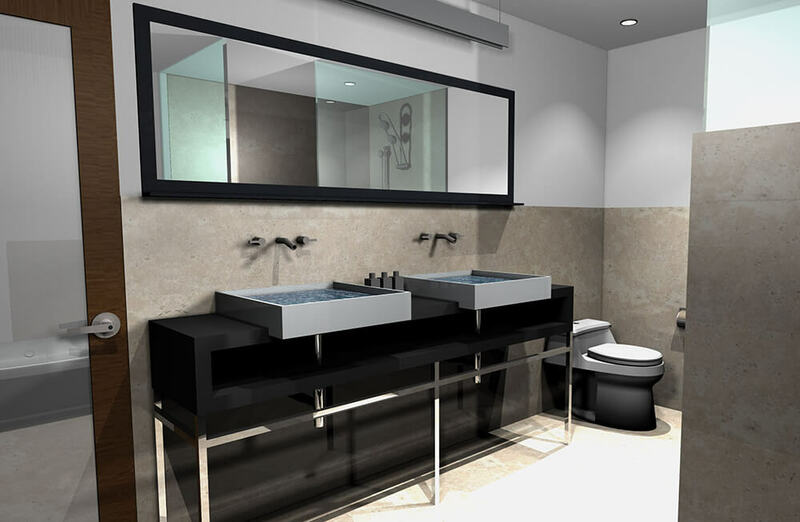 CAD rendering of earlier version of the Master Bath vanity. 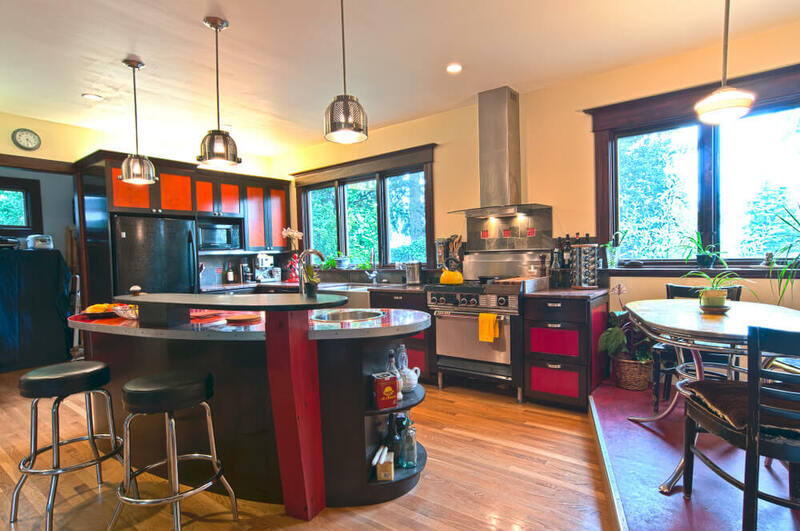 This custom kitchen was created by tearing out two bedrooms in a 1950s addition to a 1907 home in Seattle’s Central District. The kidney-shaped island is the focus of this eclectic and colorful design, complete with LED pendant lights made from repurposed colanders. The granite was salvaged from a house under demolition. 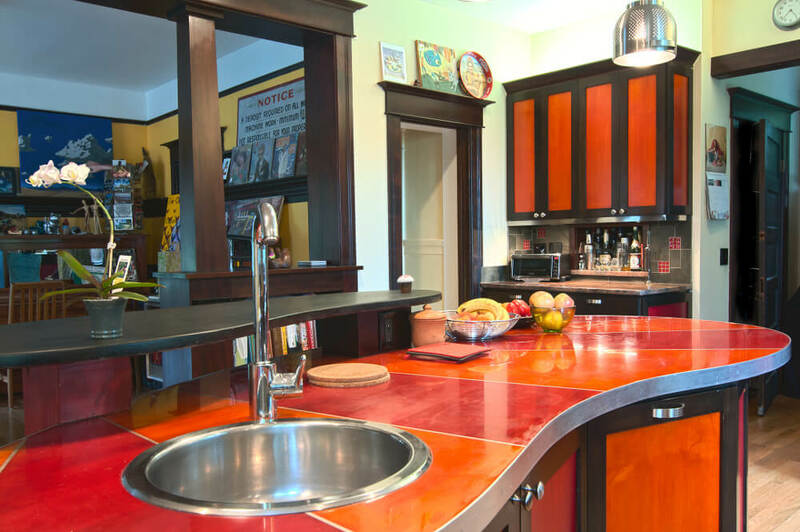 The cabinets are alder used in a shaker style with red and orange aniline-dyed inset panels. A tile back splash wraps the walls using a man-made dark gray field tile with small, red glass tile accents. The tile and stone work was performed by Chris Rogers; the cabinets were fabricated by Jon Taylor. 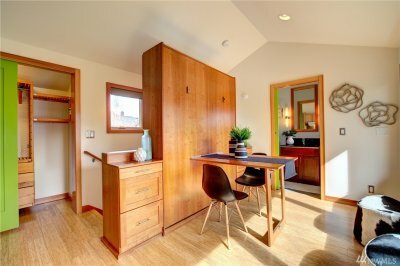 A raised dining nook adjoins the kitchen. 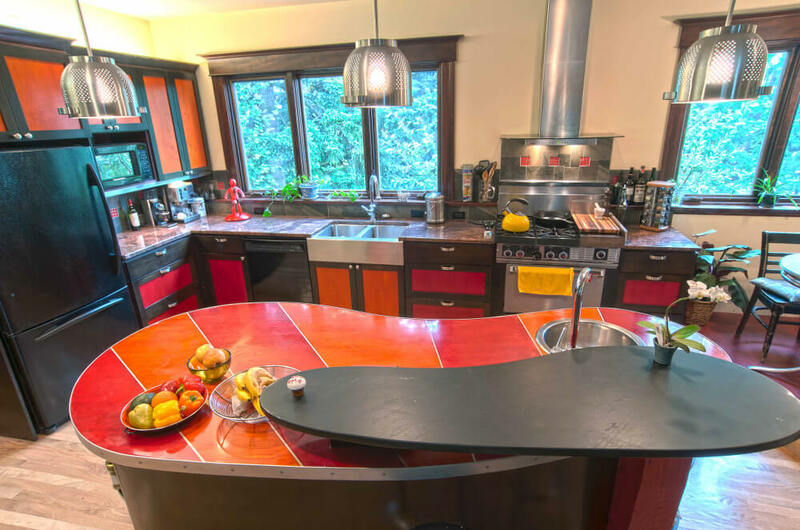 The 36″ Garland gas range was found through Craigslist and features a griddle to the right of the burners that can be covered with a custom cutting board. The two-level island features a raised bar made from slate and a lower counter constructed with aniline-dyed alder panels inlaid with aluminum strips and sealed with epoxy. 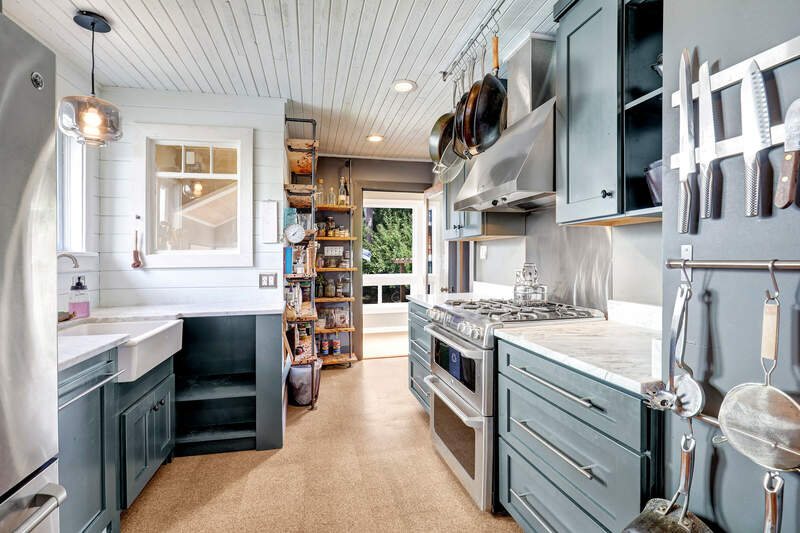 This kitchen was created by adding an additional 60 square feet of livable space to a turn-of-the-century home in Seattle’s Ballard neighborhood. 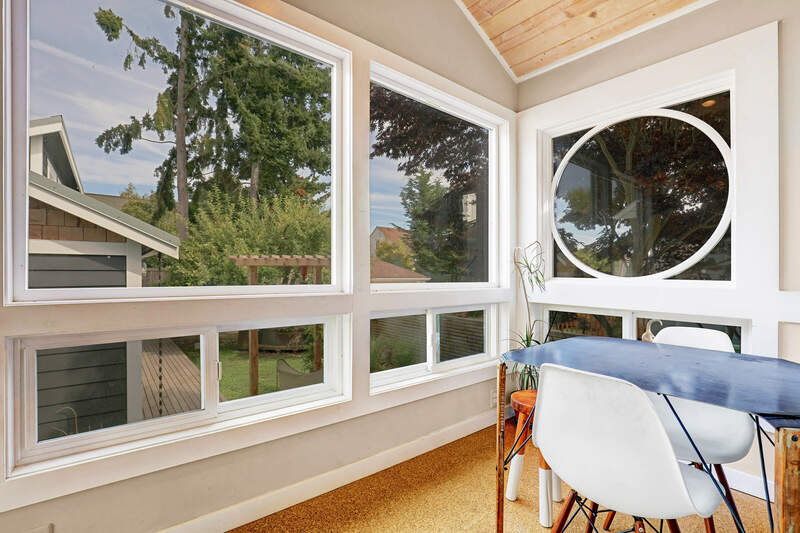 We also remodeled 200 square feet of the existing home to better incorporate the new kitchen while creating a powder room, a small mud room, and a rear porch. 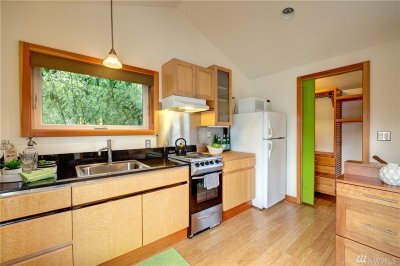 The new kitchen extends about four feet into the rear yard and features a window overlooking the garden. 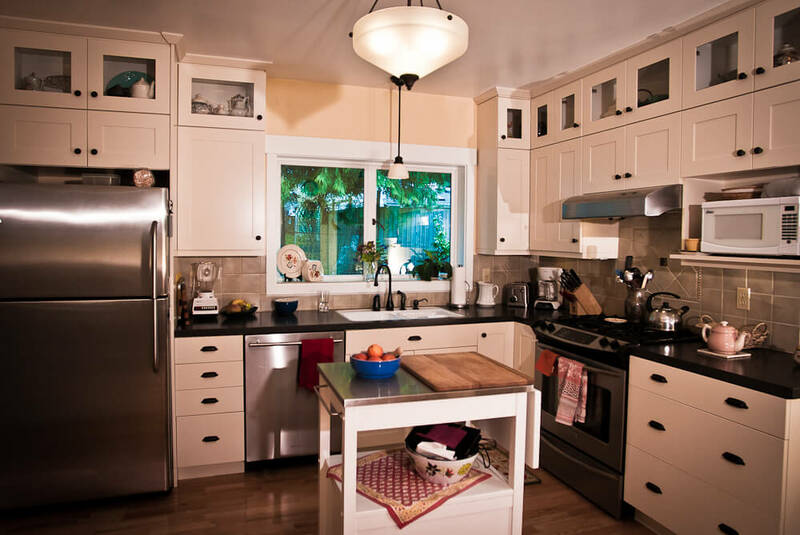 The new kitchen features painted wood cabinets with glass doors. Light fixtures and cabinet hardware were carefully chosen to evoke a turn-of-the-century aesthetic that ties the addition in with the rest of the home. A portable kitchen island allows for extra prep space, but can be moved aside to accommodate large gatherings in this compact space. The general contractor for this project was Keitam Construction. 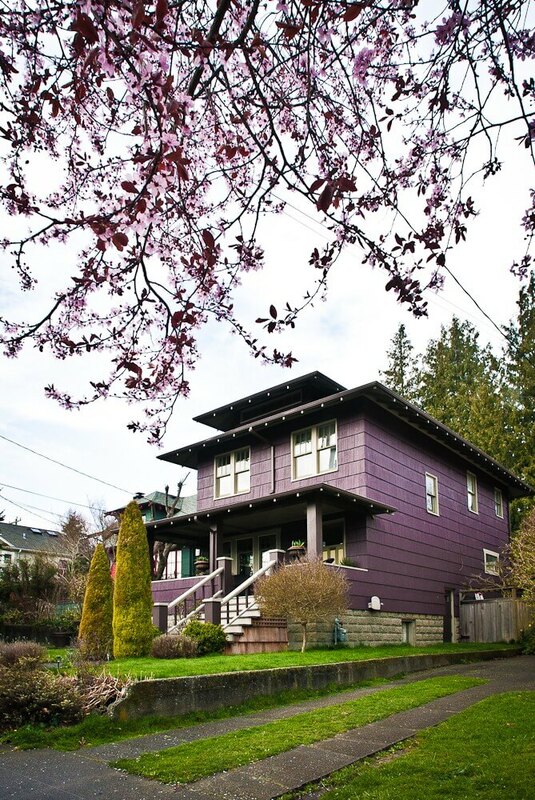 We designed this simple new porch for a client in Seattle’s Crown Hill neighborhood. Sixty square feet of covered outdoor space give the homeowner a place to sit and enjoy the mornings. 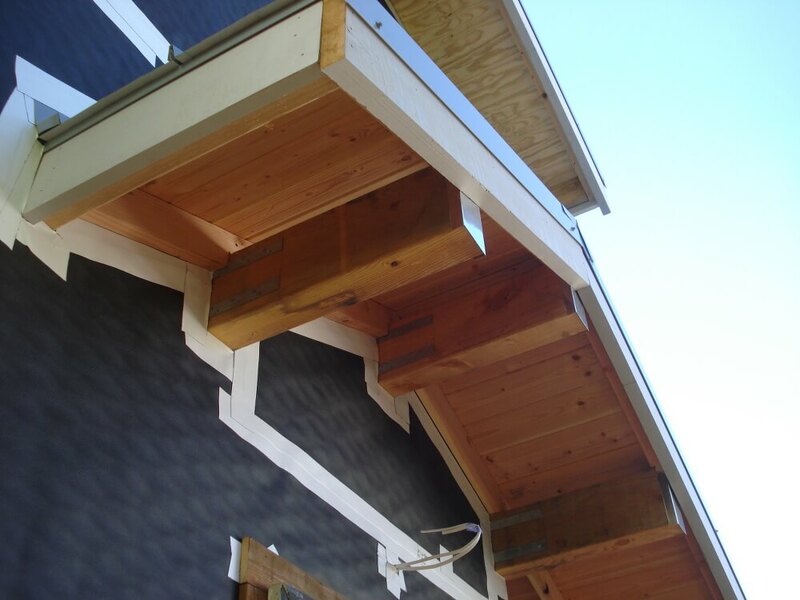 The new porch utilizes all of the permissible depth allowed by setback requirements. 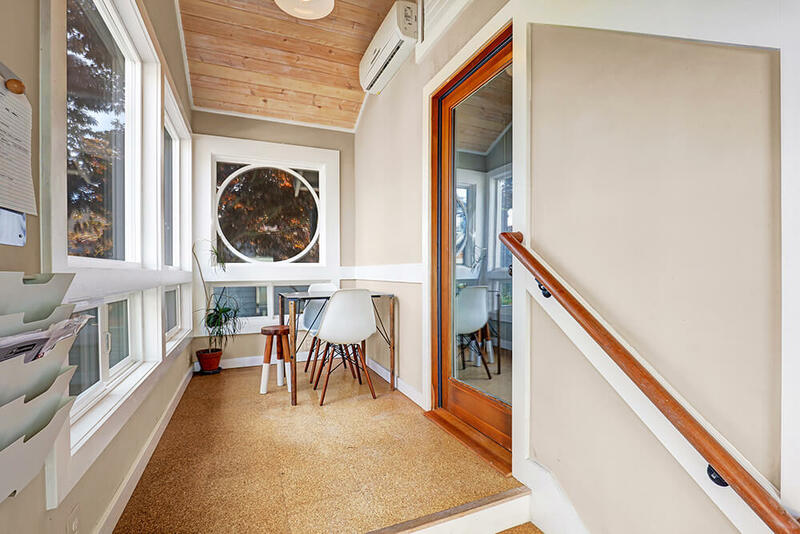 Wide wooden steps connect the porch to the front yard. 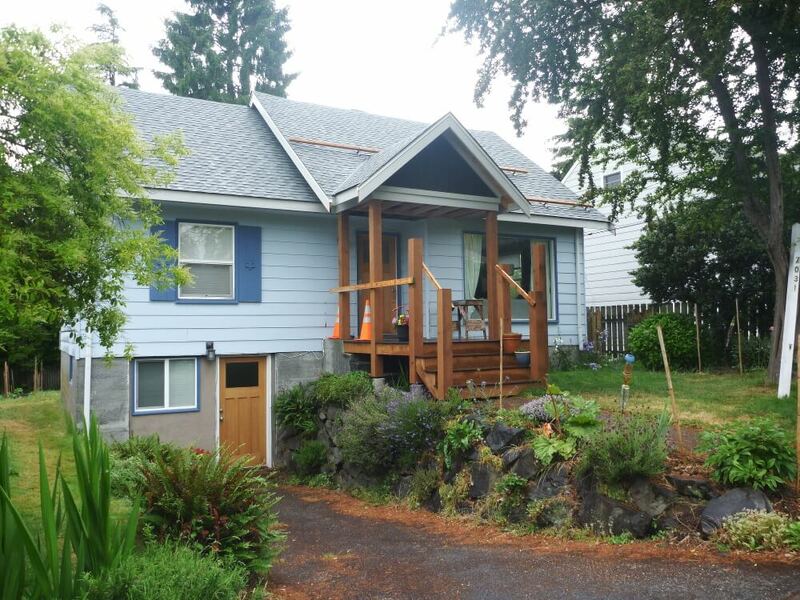 New eaves were also added to the existing roof to improve the home’s curb appeal and protect the siding and windows. 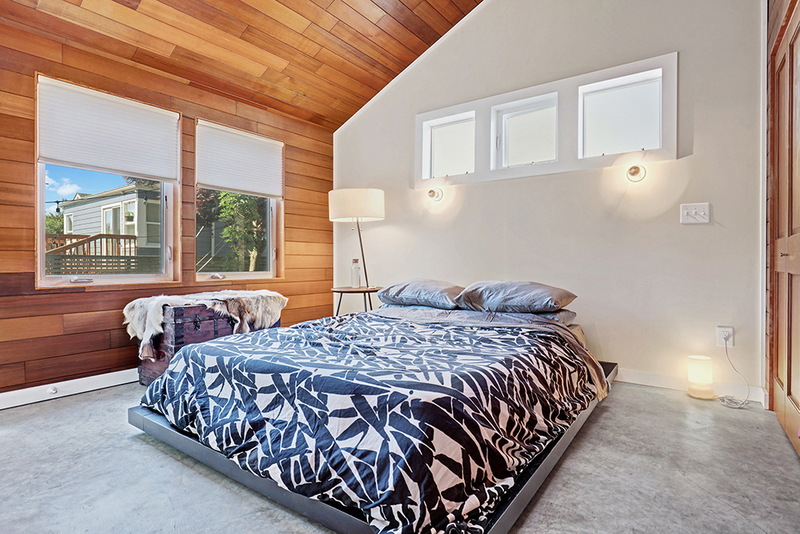 The general contractor for this project was Mike Toutant of Redpoint Construction. 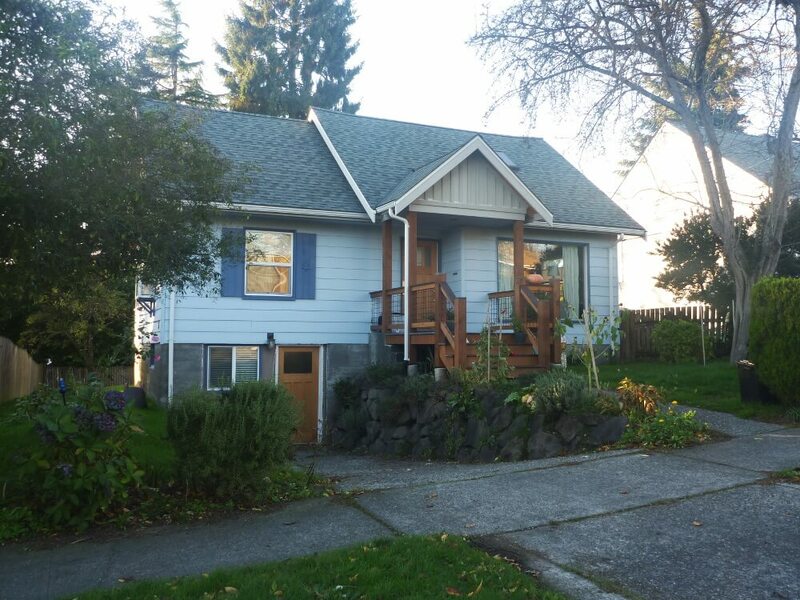 The existing house with a minimal concrete stoop. Studio DEC is a full-service design firm based in Seattle, Washington. 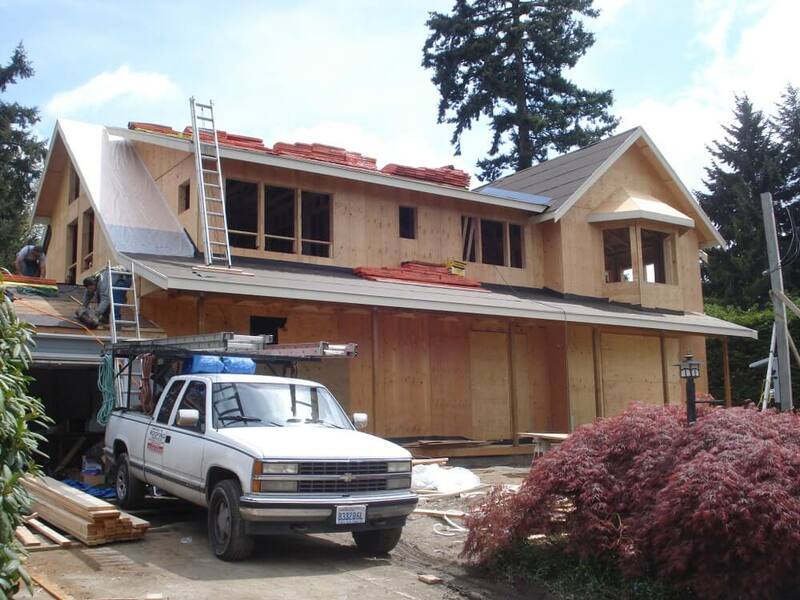 We specialize in residential remodels, additions, new home construction, and Backyard Cottages, aka DADUs. 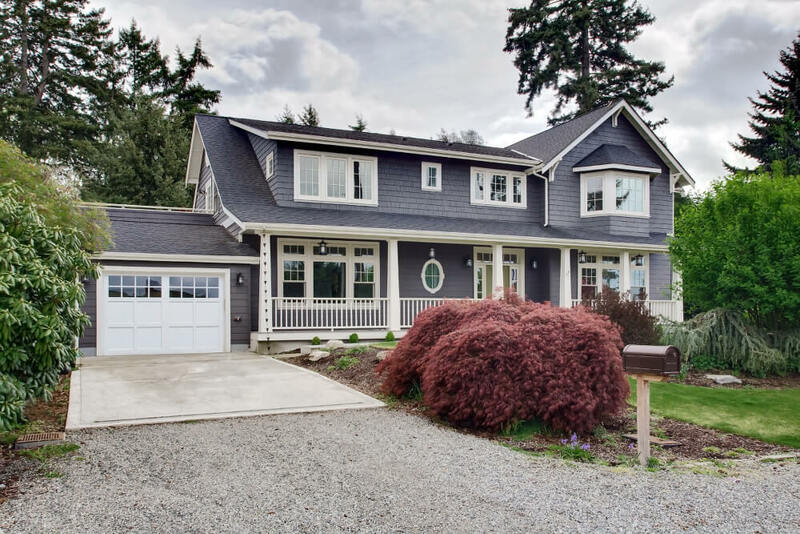 Our project portfolio ranges from budget-friendly kitchen renovations and front porch additions to the design of backyard cottages and entire homes. We are a small firm with a strong emphasis on direct client communication and listening. Our team is committed to sustainability: we believe that the greenest solution is often the most economical solution as well, whether that means taking advantage of rebates on energy-efficient appliances or practicing passive solar design to keep heating bills low.